Click the button below to add the Copper Bathtub '9922' Nickel-Platted to your wish list. Are you thinking about adding real value to the property and the high end luxury to the bathroom? Nickel plated copper bathtubs are a one big step above any other fixtures when the luxury is concerned. 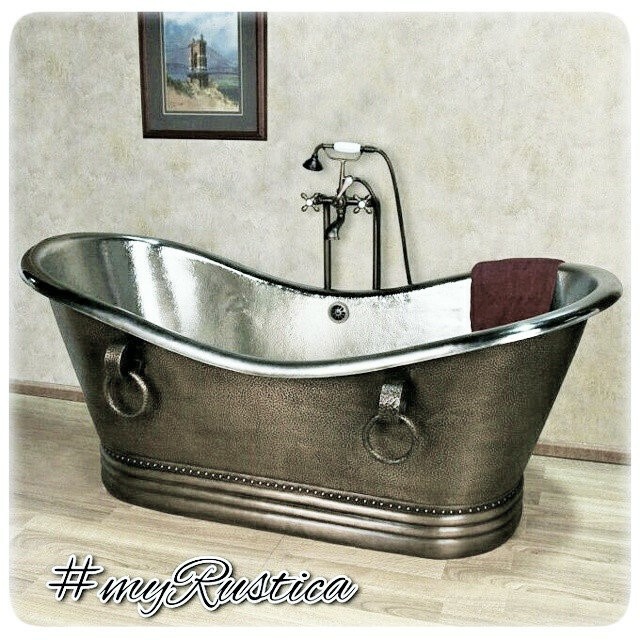 Rustica House nickel-plated copper bathtub comes in various dimensions and optional over-flow system. It may prevent water flooding the bathroom. Model '9922' is a typical grand slipper soaking tub with rings designed for two people. For the occupants convenience the bathtub drain is located at the bottom center. Rustica House recommends a licensed contractor to be employed for a nickel-platted copper bathtub installation. Finished with nickel a copper bathtub needs some occasional maintenance care. When it gets dirty wash it with warm water soap solution and dry with a soft cloth. Using metal pads or brushes is strongly prohibited. Any sharp object will cause damage to the nickel surface including copper.